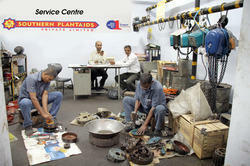 We are confirming that our Service Engineers have undergone training at our Principals Factory "Indef" – Mumbai. We have in our organization Factory Trained Service Engineers who have undergone training at our Principals’ factory and are authorized to Service/Repair INDEF, TANGEE & TRACTEL PRODUCTS. We hold huge inventory of genuine INDEF, TANGEE, TRACTEL, SPARES which will enable us to offer prompt after sales service, as and when your requirement arises. We are proud to inform you that we are the "EXCLUSIVE" Suppliers equipped with After Sales Service Facility against supplies of Hydraulic Jacks, Chain Pulley Blocks, Ratchet Lever Hoists etc. We have established a "Service Station" at Secunderabad & Hyderabad having facilities to test Hydraulic Jacks, Chain Pulley Blocks, Wire Rope & Chain Slings and other Lifting tools and tackles for its safe working load and proof load. We welcome your good self to visit our "Service Station" and inspect the various facilities available with us for Service/Repair of all types of erection tools and tackles.